I know, I know. It's been FOREVER since you've heard from me. I've posted a few blogs throughout the past year, but I basically took a step back from the blog. I know many bloggers like me who have been at this for a while (hit the 6 year mark this past September) know what I mean by feeling burnt out. The burnout was so bad that the genres I was used to reading (contemporary, romantic suspense, paranormal) were resulting in a lot of DNF's after the first chapter or so. I usually always finish a book, even if I don't particularly like it. Can I tell you how much it utterly sucked balls to not be able to read some of my favorite authors??? 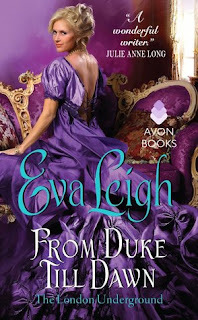 A lost feeling had me diving head first into historical romance since I hadn't read much of that particular genre, and have read almost that exclusively. Of course, I couldn't stay away from Elaine Levine's Red Team series. If you haven't read this series, you need to! After working outside the home after being a SAHM for the past 7 years, I ventured out and got a job outside the home for a wonderful previous boss who I have been able to call a dear friend. I enjoyed my time, but other factors had me back home with my minions and at a loss of what to do with my time. Talking with friends, they encouraged me to follow my dreams of pursuing my writing. So I can officially say that I have started the journey (seriously this time) of writing my first novel. I've made this attempt a few times in the past, but I didn't have the knowledge that I've gained within the past year to help me into this. It's been a challenge so far, and I'm still not far from the beginning, but I am still writing and that's the most important thing. I refuse to give up on my dream this time! So what is all my rambling leading to? I have been taking a hard look at what it is I want to do here. Do I want to keep the blog as is, or do I want to do some tweaking and add some extras to it? My inner ramblings with myself has me thinking that I will add a few extra pages with extras like info about my book, possibly movies or tv show reviews, and even some recipes I've tried (I've recently been transitioning to vegan/vegetarian). Something different needs to happen here. Just blogging books isn't going to hold my attention like it used to. I'm curious to hear what my readers here think. Should I keep the blog how it was, or do you want to see some change. Feel free to make suggestions about what else you'd like to see here. I'm all ears/eyes!